Have you ever wondered how the United States came to acquire Hawaii? Do you know anything about the history of the last state to join the country? Sarah Vowell, in her typical sarcastically funny and intelligent fashion, takes us through the history of this chain of islands that have been through so much. From the ancient Hawaiians, to the missionaries that first stepped on the shores, to President McKinley making Hawaii officially part of the United States, Vowell tells us all about the dynamic history of Hawaii. How have I made it this far in my life without reading one of Sarah Vowell's books? This book is fantastic. I loved Vowell's voice; she puts herself into the story as much as all of the historical figures and events, and the story is richer for it. We start with her contemplating her plate lunch, and how all these different cultures are together on one plate in Hawaii. She launches into the history and culture, both past and present. Her biting comments, quirky choice of words, and funny asides kept me listening and eager to hear more. I picked up this audiobook because my fiance and I are going to Hawaii for our honeymoon, and I wanted to know more about it. Plus, I've heard great things about Vowell. I wasn't disappointed. Not only did I learn a great deal about the history and culture, but I was entertained throughout it with Vowell's unique style of writing. I was kind of surprised at how much I didn't know about the islands, though I suppose I shouldn't have been. We don't learn this stuff in school, and I had no reason to learn about it before this. Not that that's an excuse, but my interest was piqued when I learned I'd actually be going there. A note on the audio edition: At first I was completely turned off by Vowell's voice. It was whinier than I was expecting. But I got used to it, and eventually started to really like how she narrated her writing in deadpan and in a conversational way. I would definitely listen to another one of her audiobooks, and most likely will. 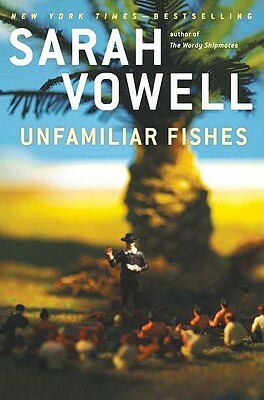 I can't wait to get my hands on Vowell's other work. Disclosure: I got this from the library. I have heard great things about Vowell's books, too but haven't read one yet. I need to correct that. Although I don't have your great reason for reading about Hawaii, I'd love to know more about this topic and trust Vowell's view will be honest and entertaining! I'm not sure about the audio because of her whiny voice. I think I will listen to a snippet and then decide. Wandered here from The librarian who doesn't say shhh. So glad I did! What a great blog!! I'll definitely be back in the future! I really enjoyed this one, but I liked The Wordy Shipmates a bit more (maybe because I've never been to Hawaii but know Boston pretty well). I have Take the Cannoli on my TBR and am thinking about reading it during the April readathon. Everyone keeps telling me that Assassination Vacation is her best, though. Ohh, I live near Boston! I will definitely have to pick up The Wordy Shipmates soon, too.